Preheat oven to 400 degrees. Grease the bottom of a baking dish with 2 Tablespoons of olive oil. Sprinkle the tilapia on both sides with the Old Bay seasoning, drizzle lemon juice on top and place in baking dish. Bake for 20 minutes. In a separate baking dish, toss the asparagus, garlic, and 1 Tbsp. olive oil, salt and pepper. Spread out evenly on the baking dish. Bake for 10-15 until the asparagus is el dente. 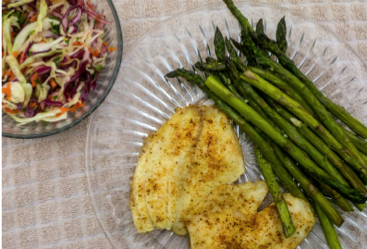 Serve the asparagus with the fish and a side of coleslaw.